Leading Ayrshire chef Mafiz Ali hosted a successful Burns Supper earlier this week, and patrons enjoyed some superb entertainment to accompany the traditional fare of haggis, neeps and tatties, and - of course - a nip of whisky. 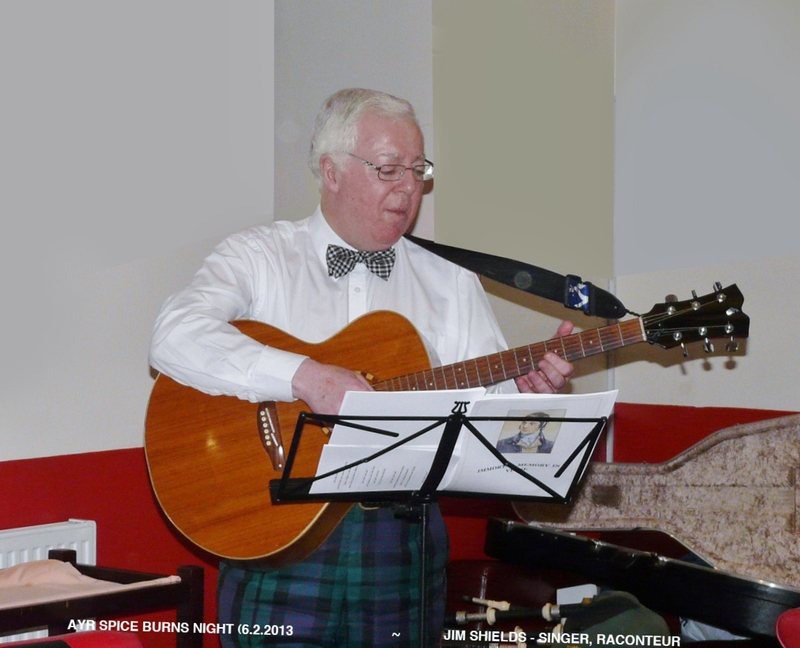 Jim Shields (pictured above), who only stepped down from his year as president of the World Burns Federation in September 2012, led the cast, proposing the toast to “The Immortal Memory” and singing a group of the Bard’s songs, accompanying himself on the guitar. 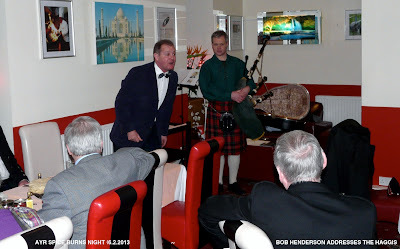 Like his “Trusty freen” Jim Shields with whom he shared master-of-ceremonies duties, Bob Henderson (pictured above) is an Ayr man who “emigrated” to “Auld Reekie” decades ago. 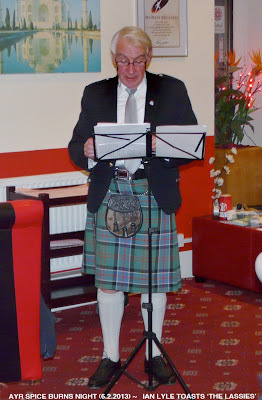 Bob addressed the haggis and recited Burns’ epic poem, “Tam o’ Shanter”. Ian Lyell, a well-known stalwart of Mauchline Burns Club and retired teacher at Kyle Academy, proposed the toast “Tae the Lassies”, and Moira Ewing (pictured below) replied. 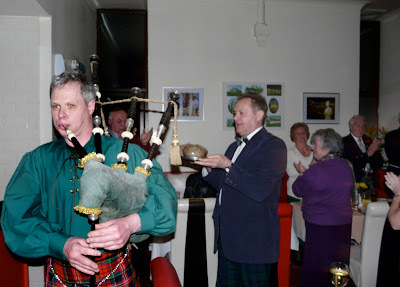 Bryce McCulloch (pictured below) piped in the haggis. A complete set of photographs taken during the successful Burns Supper event is available to view on Flickr. 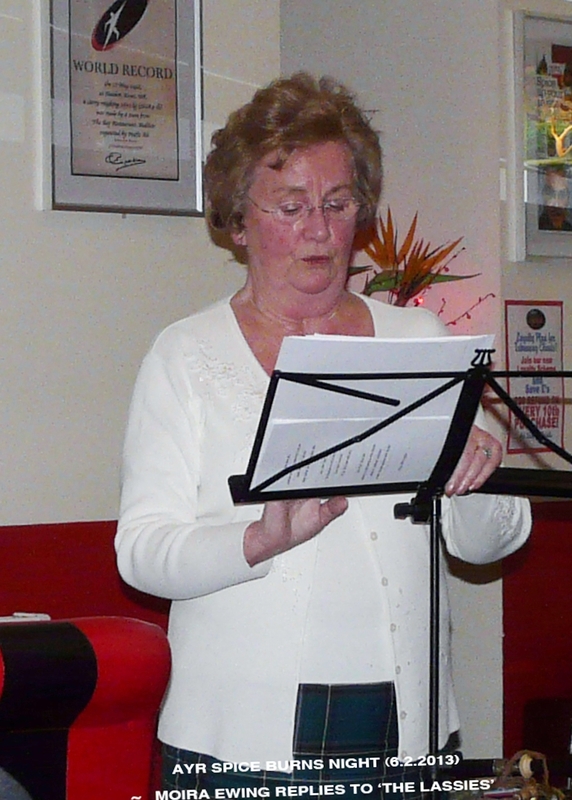 CLICK HERE and then click on any thumbnail images to access larger versions. A successful trip back in time for Alloway 1759!